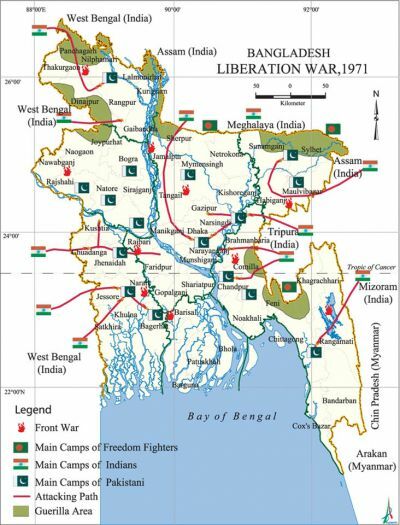 War of Liberation, The began on 26 March 1971 and ended with the liberation of Bangladesh on 16 December 1971. The armed struggle was the culmination of a series of events, situations and issues contributing to the progressively deteriorating relations between East and West Pakistan. The questions of land reforms, state language, inter-wing economic and administrative disparities, provincial autonomy, the defense of East Pakistan and many other consequential questions had been straining the relations between the two wings of Pakistan ever since independence of the country from Britain in 1947. The general elections of 1970 had made Bangabandhu sheikh mujibur rahman, chief of awami league which bagged 167 seats out of 169, the sole spokesman of the people of East Pakistan and majority leader in the Pakistan National Assembly. But the Pakistan civil and military ruling clique had refused to transfer power to the majority leader Sheikh Mujibur Rahman and his party. Sheikh Mujib also refused to yield to the pressure put on him for undue accommodation. Sheikh Mujib's historic address on 7 March 1971 made this point quite clear to the Pakistani military junta. Then began the civil disobedience movement. Meanwhile talks started between Sheikh Mujib and President Yahya Khan to resolve the outstanding issues. While holding talks, the Pakistani military junta was bringing more troops to Bangladesh, and at the same time wantonly killing innocent civilians all over the country. This clearly showed that they were totally insincere about handing over power to the elected representatives of East Pakistan. No sooner the talks failed, the genocide began with the Pakistan army's crackdown on the people of East Pakistan on the midnight of 25 March 1971. The Bangali soldiers serving in the then Pakistan Armed Forces and para militia forces declared instantly their solidarity with the people's liberation war. 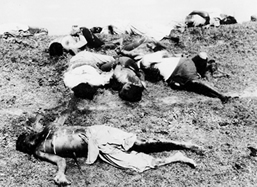 The Pakistan Army was ordered to launch operation on Bangali people at midnight of 25 March. According to the plan for operation Search Light two headquarters were established. Major General Rao Farman Ali with 57 Brigade under Brigedier Arbab was responsible for operation in Dhaka city and its suburbs while Major General Khadim Raja was given the responsibility of the rest of the province. Lieutenant General Tikka Khan assumed the overall charge of the operation. The students and the nationalist political activists put up resistance outside the cantonment. Road blocks were raised to obstruct the march of the Pakistani column to the city areas. The wireless set fitted jeeps and trucks loaded with troops groaned on the streets of Dhaka City at midnight of 25 March. The first column of the Pakistan army faced obstruction at Farmgate, about one kilometre from the cantonment, due to a huge road block created by placing big tree trunks across the road. The hulks of old cars and unserviceable steam roller were also used in creating the blockade. Several hundred people chanted the slogan Joi Bangla which lasted for about 15 minutes. But soon guns silenced them. The army moved into the city before scheduled time and started the genocide. The military forces killed everybody in sight on the footpath and destroyed everything on their way. The tanks roared through the streets of Dhaka blasting indiscriminately at the people and official and residential buildings. They gunned down clusters of settlements and set fire on them. Scores of artillery bursts were pounded, while the tanks rumbled into the city roaring the main streets. The student halls of residence at Dhaka University were raided and numerous students residing there were brutally killed and maimed. They also killed many teachers of Dhaka University. The Hindu concentrated areas of old Dhaka were particularly targeted. They started killing the people, burnt their houses, looted their valuables and raped their women. The genocide that was perpetrated on the unarmed people was flashed in the world press. On the night of 25 March Sheikh Mujibur Rahman was taken prisoner by the Pakistan army. 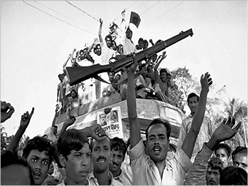 There were spontaneous uprisings throughout Bangladesh following the declaration of independence on 26 March 1971. These uprisings were participated by government officials, political activists, students, workers, peasants, professionals and members of the public. After initial resistance, many freedom fighters crossed over into Indian territory to have safe sanctuary, due mainly to the enemy's overwhelming superiority of trained soldiers and modern weapons. The scattered and temporarily retreating rudimentary liberation forces were soon brought under a unified command. On 4 April, the senior officers of the liberation army assembled at the headquarters of 2nd East Bengal at Teliapara, a semi hilly area covered by tea gardens where Colonel MAG Osmany, Lieutenant Colonel Abdur Rob, Lieutenant Colonel Salahuddin Mohammad Reja, Major Kazi Nuruzzaman, Major Khaled Mosharraf, Major Nurul Islam, Major Shafat Jamil, Major Mainul Hossain Chowdhury and others were present. In this meeting four senior commanders were entrusted with the responsibility of operational areas. Sylhet-Brahmanbaria area was placed under the command of Major Shafiullah. Comilla-Noakhali area was given to Major Khaled Mosharraf while Chittagong-Chittagong Hill Tracts was given to Major Ziaur Rahman. Kushtia-Jessore area was placed under command of Major Abu Osman Chowdhury. In the meeting the organisational concept of the freedom fighter forces and the command structure were chalked out. Colonel MAG Osmany was to command the liberation forces, later named as mukti bahini. An exile government called the People's Republic of Bangladesh Government alias mujibnagar government was formed on 10 April with Bangabandhu Sheikh Mujibur Rahaman as President of the Republic, Syed Nazrul Islam as Vice President and Tajuddin Ahmed as Prime Minister. On the day following Tajuddin Ahmed announced the names of three more regional commanders, Captain Newazish for Rangpur region, Major Najmul Haque for Dinajpur-Rajshahi-Pabna and Major Jalil for Barisal-Patuakhali region. All these regions were later named as sectors. All of Bangladesh was divided into eleven such sectors and different sub-sectors for operational purposes during the Sector Commander's conference held from 10 to 17 July 1971. On 27 March, Prime Minister of India Mrs. Indira Gandhi expressed full support of her government to the freedom struggle of the Bangalis. Indian Border Security Force (BSF) opened Bangladesh-India border to allow the tortured and panic stricken Bangalis to have safe shelter in India. 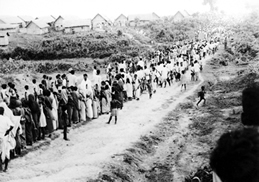 The governments of West Bengal, Bihar, Assam, Meghalaya and Tripura established refugee camps along the border. These camps became ready ground for recruitment of the freedom fighters. The students, peasants, workers and political activists joined the Mukti Bahini with high spirit to liberate Bangladesh from the Pakistan army. They were given training on tactics and the use of arms and explosives. On completion of training, they were posted to different sectors to fight the enemy. The headquarters of the Bangladesh Forces was established at 8 Theatre Road, Calcutta which started functioning from 12 April 1971. Lieutenant Colonel M A Rab and Group Captain A K Khandaker were appointed as Chief of Staff and Deputy Chief of Staff respectively. Besides Mukti Bahini, many other bahinis were organised inside Bangladesh at different places to fight Pakistan Army. These Bahinis included Kader Bahini of Tangail, Latif Mirza Bahini of Sirajganj, Akbar Hossain Bahini of Jhinaidah, Hemayet Bahini of Faridpur, Quddus Molla and Gafur Bahini of Barisal, Afsar Bahini of Mymensingh and Aftab Bahini of Mymensingh. A crack platoon consisting of daring youths operated most valiantly in Dhaka city as well. These bahinis were established as a local force based on their own strength taking part in a number of battles with the occupation army. Siraj Sikdar, leader of Sarbahara Party, also organised his force in Barisal. Another Bahini named as Mujib Bahini was organised in India with the active assistance of Major General Oban of the Indian army who was an expert in guerilla warfare. Mujib Bahini was trained at Dehradun. Student League leaders Sheikh Fazlul Haq Mani, Tofael Ahmed, Abdur Razzak and Sirajul Alam Khan were organisers of this Bahini. Mukti Bahini consisted of the regular and the irregular forces. The regulars were later called 'Niamita Bahini' (regular force) and the irregulars were called 'Gana Bahini' (people's force). The regulars included East Bengal Regiment and EPR troops. The irregular forces, which after initial training joined different sectors, consisted of the students, peasants, workers and political activists. Irregular forces were inducted inside Bangladesh territory to adopt guerilla warfare against the enemy. The regular forces were engaged in fighting in conventional way. The first conventional brigade named as 'Z' Force was created in July. Major Ziaur Rahman was appointed commander of this brigade and the brigade was named as 'Z' Force after the first letter of his name. This brigade consisted of 1, 3 and 8 East Bengal. Second regular brigade 'S' Force was created in October and consisted of 2 and 11 East Bengal. 'S' Force was named after the initial letter of the name of its commander Shafiullah. Similarly the 'K' Force created with 4, 9 and 10 East Bengal was commanded by Khaled Mosharraf. Bangladesh Air Force, which was organised by Air Commodore A K Khondaker, was created in Dimapur of Nagaland on 28 September. Squadron Leader Sultan Mahmud, Flight Lieutenant Badrul Alam, Captain Khaleq, Sattar, Shahabuddin, Mukit, Akram and Sharfuddin and 67 airmen initially joined the Bangladesh Air Force, which had only few Dakota, Auter type air plane and Aluvet helicopters. Similarly, Bangladesh Navy was also established with the Naval troops deserted from the Pakistan Navy. On 9 November 1971, the first naval fleet 'Bangabandhu Naubahar' consisting of six small ships was inaugurated. The command structure of the Bangladesh Forces was fully organised with the regular brigades, sector troops and guerilla forces, the Bangladesh Air Force and the Navy. At the international level, the United States of America and the People's Republic of China considered the crisis as an internal affair of Pakistan. On the other hand, India, Soviet Union and her allies, and general masses in Japan, and Western countries stood solidly behind Bangladesh. In order to gain strategic advantage vis-a-vis Sino-US-Pakistan axis, Indo-Soviet Friendship Treaty was signed on 9 August 1971. It provided a new dimension to the War of Liberation. Having realised that the Pakistan army could not be defeated by conventional warfare method, it was decided to create large guerilla forces all over the country. All Sector commanders were accordingly ordered to recruit, train and induct guerillas inside the country. 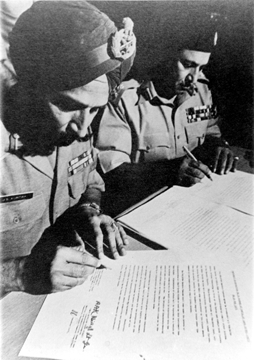 The joint command of the Mukti Bahini and the Indian army was underway from November 1971. Lieutenant General Jagjit Singh Aurora, Commander, Eastern Command of Indian Army, became the commander of the joint forces. The joint command of the Mukti Bahini and the Indian Army, however, started operation from the evening of 3 December, when the Pakistan Air Force bombed Amritsar, Sreenagar and the Kashmir valley. Immediately, the Indian armed forces were ordered to hit back the Pakistan army and thus the Indo-Pak war broke out. The Mukti Bahini and the Indian army continued advancing inside Bangladesh and the defeat and surrender of the Pakistan army became a matter of time. International efforts for a cease-fire failed due to Soviet veto in the United Nations Security Council. The Indian troops and the freedom fighters of Sector 11 reached Tongi on 14 December, and Savar in the morning of 16 December. Major General Jamshed, commander 36 Division of the Pakistan Army received Major General Nagra at Mirpur Bridge near Dhaka City. The Mukti Bahini and the Indian forces entered Dhaka city at 10.10 a. m. Major General Jacob, the chief of staff of the Indian Eastern Command landed at Dhaka airport at 1 p.m with the draft instrument of surrender. Sectors of War of Liberation In the War of Liberation in 1971 the whole geographical area of the then East Pakistan was strategically divided into eleven sectors with a sector commander for each of them. For better efficiency in military operations each of the sectors were divided into a number of sub-sectors under a commander. Sector 1 comprised of the districts of Chittagong and Chittagong Hill Tracts, and the entire eastern area of the Noakhali district on the banks of the river Muhuri in the Belonia Bulge.. The headquarters of the sector was at Harina. The sector commander was Major Ziaur Rahman, later replaced by Major Rafiqul Islam. The five sub-sectors of this sector (and their commanders) were: Rishimukh (Captain Shamsul Islam); Sreenagar (Captain Matiur Rahman, later replaced by Captain Mahfuzur Rahman); Manughat (Captain Mahfuzur Rahman); Tabalchhari (Subedar Ali Hossain); and Dimagiri (a subedar). A contingent of nearly ten thousand freedom fighters fought in this sector. They included about two thousand regular troops which comprised of 1400 EPR personnel, 200 policemen, 300 army personnel and 100 men from the navy and air force and about eight thousand paramilitary troops. The guerilla fighters of this sector were deputed to operate inside the country in 137 groups. Sector 2 comprised of the districts of Dhaka, Comilla, and Faridpur, and part of Noakhali district. This sector was raised from the nucleus of 4 East Bengal and the EPR troops of Comilla and Noakhali. The sector was located at Melaghar about 20 miles south of Agartala. The sector commander was Major Khaled Mosharraf, later replaced by Major ATM Haider. About thirty five thousand guerilla fighters fought in this sector. Nearly six thousand of them were members of regular armed forces. The six sub-sectors of this sector (and their commanders) were: Gangasagar, Akhaura and Kasba (Mahbub, later replaced by Lieutenant Farooq, and Lieutenant Humayun Kabir); Mandabhav (Captain Gaffar); Shalda-nadi (Abdus Saleq Chowdhury); Matinagar (Lieutenant Didarul Alam); Nirbhoypur (Captain Akbar, later replaced by Lieutant Mahbub); and Rajnagar (Captain Jafar Imam, later replaced by Captain Shahid, and Lieutenant Imamuzzaman). Due to the operations of this sector the Dhaka-Chittagong highway in between Comilla and Feni was denied to the Pakistanis throughout the nine months of war of liberation. One of the most successful operations of this sector was the defence of the Belonia Bulge. The entries Belonia Bulge was kept liberated by the combined forces of 1 and 2 sectors till 21 June. In this sector, a number of regular companies operated deep inside Bangladesh. These were the Noakhali Company under subeder Lutfar Rahman operating around Begumganj, the Chandpur Company under subeder Zahirul Alam Khan operating in Chandpur Matlab area, a large force under Captain Abdul Halim Chowdhury operating in Manikganj-Munshiganj area in Dhaka and a force under Captain Shawkat at Faridpur. 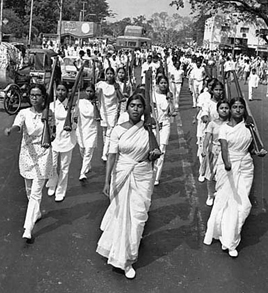 The urban guerrillas carried out a number of successful operations in Dhaka city itself. Sector 3 comprised of the area between Churaman Kathi (near Sreemangal) and Sylhet in the north and Singerbil of Brahmanbaria in the south. The sector commander was Major KM Shafiullah, later replaced by Major ANM Nuruzzaman. 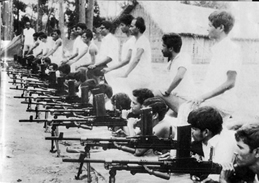 This sector was formed by some of the troops of 2 East Bengal and the EPR troops of Sylhet and Mymensingh. The sector headquarters was at Hejamara. Nineteen guerilla bases operated in this sector. By November 1971, the number of the guerilla fighters in the sector stood at nearly thirty thousand. They blew up a number of bridges on Comilla-Sylhet road which cut off Pakistan army's lines of communication. One of their most successful operations was the blowing up of a train by anti-tank mine near Shayestaganj. The ten sub-sectors of this sector (and their commanders) were: Asrambari (Captain Aziz, later replaced by Captain Ejaz); Baghaibari (Captain Aziz, later replaced by Captain Ejaz); Hatkata (Captain Matiur Rahman); Simla (Captain Matin); Panchabati (Captain Nasim); Mantala (Captain MSA Bhuyan); Vijoynagar (Captain MSA Bhuyan); Kalachhara (Lieutenant Majumdar); Kalkalia (Lieutenant Golam Helal Morshed); and Bamutia (Lieutenant Sayeed). Sector 4 comprised of the area from Habiganj sub-division of Sylhet district on the north to Kanaighat thana on the south along the 100 mile long border with India. The sector was organised from amongst the EPR troops of Sylhet and student freedom fighters. The sector commander was Major Chittarajan Datta, later replaced by Captain A Rab. The headquarters of the sector was initially at Karimganj and later at Masimpur in Assam. The freedom fighters in this sector included about nine thousand guerilla fighters and about four thousand regular members of the armed forces. The six sub-sectors of this sector (and their commanders) were: Jalalpur (Masudur Rab Sadi); Barapunji (Captain A Rab); Amlasid (Lieutenant Zahir); Kukital (Flight Lieutenant Kader, later replaced by Captain Shariful Haq); Kailas Shahar (Lieutenant Wakiuzzaman); and Kamalpur (Captain Enam). Sector 5 comprised of the area from Durgapur to Dauki (Tamabil) of Sylhet district and the entire area upto the eastern borders of the district. Sector commander was Major Mir Shawkat Ali. The headquarters of the sector was at Banshtala. The sector was composed of 800 regulars and 5000 guerillas. The sector covered most of the marshy areas of Sunamganj and Chhatak. The six sub-sectors of this sector (and their commanders) were: Muktapur (Subedar Nazir Hossain, freedom fighter Faruq was second in command); Dauki (Subedar Major BR Chowdhury); Shela (Captain Helal, who had two assistant commanders, Lieutenant Mahbubar Rahman and Lieutenant Abdur Rauf); Bholaganj (Lieutenant Taheruddin Akhunji who had Lieutenant SM Khaled as assistant commander); Balat (Subedar Ghani, later replaced by Captain Salahuddin and Enamul Haq Chowdhury); and Barachhara (Captain Muslim Uddin). Troops of this sector blew up a number of bridges on Sylhet, Tamabil and Sylhet-Sunamgonj roads. 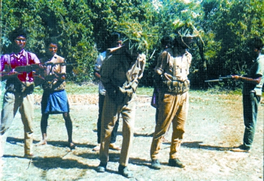 The most successful operation of this sector was the raid on Chhatak. Sector 6 comprised of entire Rangpur district and Thakurgaon subdivision of Dinajpur district. The sector was formed mostly from EPR troops of Rangpur and Dinajpur. Wing Commander M Khdemul Bashar was the sector commander. The headquarters of the sector was at Burimari near Patgram, and this was the only sector which had its headquarters inside Bangladesh territory. The number of soldiers in this sector was 700, which rose to about eleven thousand in December consisting of 2000 regular force and 9000 Gana Bahini. The five sub-sectors of the sector (and their commanders) were: Bhajanpur (Captain Nazrul, later replaced by Squadron leader Sadruddin and Captain Shahriyar); Patgram (initially, some junior commissioned officers of the EPR, and later Captain Matiur Rahman); Sahebganj (Captain Nawazesh Uddin); Mogalhat (Captain Delwar); and Chilahati (Flight Lieutenant Iqbal). The northern areas of Rangpur district were held by the troops of this sector. 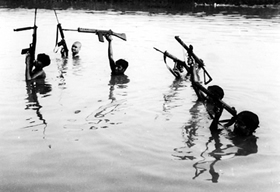 The guerillas of this sector established 35 bases all over Rangpur and Dinajpur. Sector 7 comprised of the districts of Rajshahi, Pabna, Bogra and southern part of Dinajpur district. This sector was organised from the EPR troops who had given the initial battles at Rajshahi under Captain Ghiyas and Captain Rashid. The sector commander was Major Nazrul Haq, later replaced by Subedar Major A Rab and Major Kazi Nuruzzaman. The headquarters of the sector was at Tarangapur near Balurghat. About 2500 regulars and 12500 guerillas fought in this sector. The eight sub-sectors of the sector (and their commanders were): Malan (initially some junior commanding officers, and later Captain Mohiuddin Jahangir); Tapan (Major Nazmul Haq, later replaced by some junior commanding officers of the EPR); Mehdipur (Subedar Iliyas, later replaced by Captain Mahiuddin Jahangir); Hamzapur (Captain Idris); Anginabad (a freedom fighter); Sheikhpara (Captain Rashid); Thokrabari (Subedar Muazzam); and Lalgola (Captain Gheyasuddin Chowdhury). The troops of this sector raided Maheskanda and Paragpur in June and the Mohanpur police station in August inflicting heavy casualties to the enemy. Captain Idris, commander of the Hamzapur sub-sector, ambushed several Pakistani columns and blew up a train near Parbatipur. 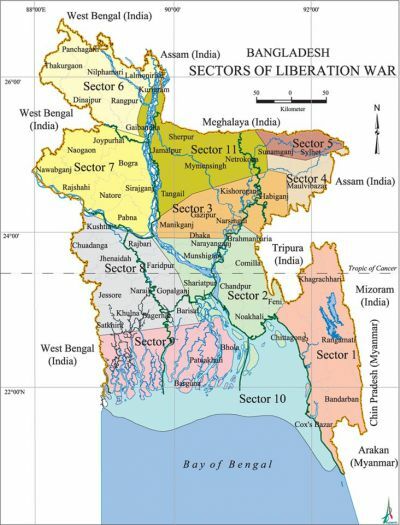 Sector 8 In April 1971, the operational area of the sector comprised the districts of Kushtia, Jessore, Khulna, Barisal, Faridpur and Patuakhali. At the end of May the sector was reconstituted and comprised the districts of Kusthia, Jessore and Khulna, Satkhira sub-division, and the northern part of Faridpur district. The sector commander was Major Abu Osman Chowdhury, later replaced by Major MA Manzur. The headquarters of the sector was at Kalyani. The sector had 3000 regulars and 25,000 guerillas. 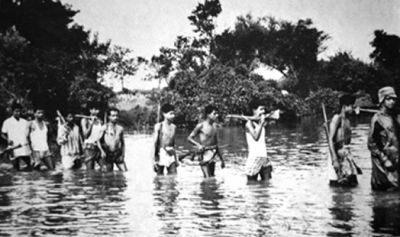 The regular forces held a number of liberated areas while the guerillas established several bases deep inside Bangladesh. In this sector a new tactics was followed. Regular troops were made to infiltrate 7 of 8 miles inside Bangladesh and take up all-round defence around a tactical feature, thereby inviting the Pakistan army to attack on them. By doing so, they inflicted heavy casualties to the attacking enemy. The seven sub-sectors of the sector (and their commanders) were: Boyra (Captain Khondakar Nazmul Huda); Hakimpur (Captain Shafiq Ullah); Bhomra (Captain Salahuddin, later replaced by Captain Shahabuddin); Lalbazar (Captain AR Azam Chowdhury); Banpur (Captain Mostafizur Rahman); Benapole (Captain Abdul Halim, later replaced by Captain Tawfiq-e-Elahi Chowdhury); and Shikarpur (Captain Tawfiq-e-Elahi Chowdhury, later replaced by Lieutenant Jahangir). Sector 9 comprised of the districts of Barisal and Patuakhali, and southern part of Khulna and part of Faridpur district. The headquarters of the sector was established at Taki near Bashirhat. The sector commander was Major M Jalil, later replaced by Major MA Manzur and Major Joynal Abedin. The sector had about 20,000 freedom fighters. The three sub-sectors of the sector were: Taki, Hingalganj, and Shamshernagar. In this sectror even regular troops operated deep inside Bangladesh. Captain Shahjahan Omar led a large group of guerillas in Barisal. Captain Mehdi Ali Imam operated in Patuakhali from an established base. Lt Zia organised a huge force in Sundarbans. Captain Huda commanded the bulk of the regular troops near the border. He captured Uksha border outpost in June and kept it liberated throughout. The troops of this sector also raided Debhata Shyamnagar police stations. The water channels of Barisal-Patuakhali area mostly dominated by river patrolling. Prior to the final offensive in December this sector was merged with sector 8 and placed under the command of Major Manzoor. Sector 10 This sector was constituted with the naval commandos. Eight Bangali officers of Pakistan Navy trained in France were the pioneers in forming this force. These officers were Ghazi Mohammad Rahmatullah (Chief Petty Officer), Syed Mosharraf Hossain (Petty Officer), Amin Ullah Sheikh (Petty Officer); Ahsan Ullah (M E-1), AW Chowdhury (RO-1), Badiul Alam (ME-1), AR Miah (EN-1), Abedur Rahman (Steward-1). These eight officers were given special training on the river Jamuna near Delhi under the auspices of the Indian Navy. They were joined by a number of sailors who had defected from Pakistan Navy. A group of 150 student volunteers were selected from various sectors who were known to be good swimmers and sent to this camp for training. They were trained in fragmenship and use of limpet mines for destruction of ships and vessels. On completion of training in the first week of August, four groups were sent to the ports of Chittagong, Narayanganj, Daudkandi and Mongla for destruction and saboteering of coastal vessels anchored there. On the day of independence of Pakistan, all the four groups striked simultaneously and destroyed a good number of ships and other vessels. The Chittagong group led by AW Choudhury destroyed seven ships including the Pakistani cargo ships MV Ohrmazd and MV Al-Abbas which were carrying huge tonnages of military cargo. Later in October and November, a few more similar operations were carried out sucessfully and a good number of sea-going and coastal vessels were sunk in the ports all over Bangladesh. The force was later commanded by Indian commander MN Sumanta. This page was last modified on 9 December 2015, at 15:57. This page has been accessed 61,581 times.